The Belle of Broadway took the stage as the headline entertainment at this nonprofit auction. And in those 30 minutes, she made me a lifelong fan. She’s at an age (born in 1933) when many women would not comfortable showing their arms or their legs. But this gal still has the body and the shimmy to prove it. Or maybe she has the shimmy, and the body to prove it. At any rate, the Red Apple Auctions team was excited to perform on the same stage as Chita at the nonprofit auction last night. This 3-minute clip of her final song will give you a taste of her vivaciousness. No wonder she was on so many Broadway marquees: Chicago, West Side Story, Kiss of the Spiderwoman, Bye Bye Birdie, and so forth. 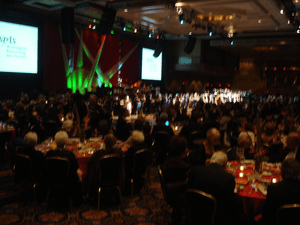 Each year, the Washington Performing Arts Society has an outstanding performer at its gala. In 2008, pianist Yuja Wang tickled the ivories. In 2009, Wynton Marsalis got the crowd dancing. And this year, Chita Rivera took the stage. She was a fabulous performer! She told life stories, sang, and danced. If you’re seeking some fun headline entertainment, I’d place a all to her agent. Even if you happen to have younger guests attending your nonprofit auction, her sparkling personality would win them over.